As many brides go about planning their wedding, a common conundrum is whether to have their ceremony on-site or at a nearby church or other ceremony location. Planning a wedding in Boston makes this issue an especially sharp one thanks to the difficulty of parking cars (and for some, driving) in an urban location. While some brides may dream of a church wedding, the reality is that a location like Boston sometimes practicality dictates an on-site ceremony. When seeking a location that doubles for both ceremony and reception, brides are often disappointed by the lack of decorative, romantic rooms in which to have their wedding ceremony. We have a few tips to consider when deciding whether an on-site ceremony is for you. Consider an historical venue. 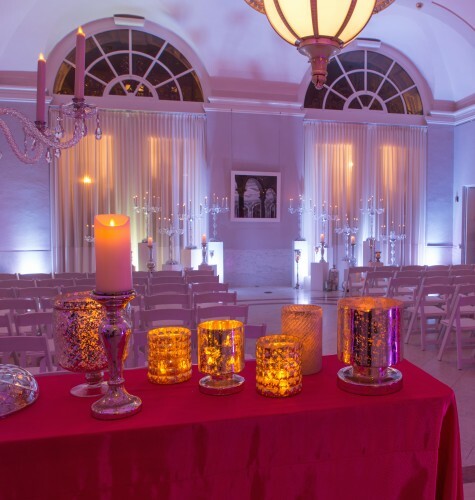 These venues are innately suited towards ceremonies on-site because they often have stunning architectural details and unique decor, unlike something like a hotel conference room, which might be simpler and more of a blank canvas. Envision flowers and arches. Your event planner and florist can work together to create a focal point to the room that is reminiscent of a traditional church, where all eyes go to the altar. A chuppah, flowered archway or other decor at the front of the room can help create this illusion even if the space isn’t a traditional ceremony space. Think about the trade-offs. You might be concerned with the cost of rentals, flowers and decor to make a ceremony room your own, but consider what the trade-off would be. Would you be asking guests to drive through city traffic? Park in two garages? Paying for a trolley to take them from one location to the other? Think about your guests’ convenience when you’re considering what’s best for you. Consider a unique setup. Is the room oddly shaped or not what you were envisioning? Consider setting it up with the chairs in a circle around the bride and groom, which can be both striking and symbolic, or in another unusual way to make the space what you want it to be. The Popular Reading Room: With lots of natural light from nearby windows, this room is a shoo-in for daytime ceremonies. 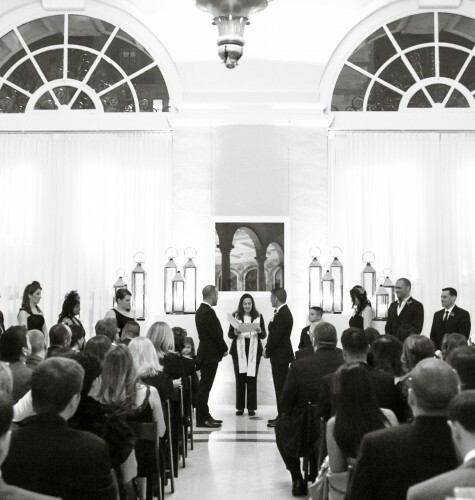 We worked with the room’s columns instead of against them, setting up the ceremony in an unconventional circle instead of straight rows of chairs. We played on the neutral tones of the room with the simple flowers and greenery that framed the ceremony space. 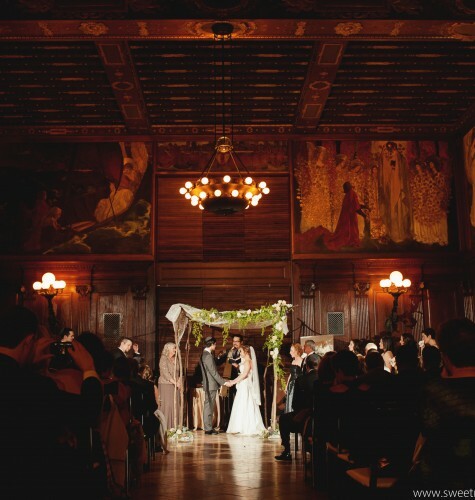 Bates Hall: The linear nature of this traditional reading room, with its rows of long tables, best mimics a traditional church setting’s pews, and the center aisle in the room provides a fabulous entrance for the bride and exit for the newlyweds. Dramatic, high ceilings and marble details add to the churchlike feel of the hall. The room’s abundance of architectural details and pops of color with its green-shaded reading lamps means that decor can be kept to a minimum for a ceremony. Here, we added slim flowering branches on the unoccupied tables to for a whimsical feel. The Library Lobby: This small ceremony was the perfect fit for the library’s main lobby, with its beautiful arched foyer and painted ceilings. The marble stairs, floors and walls combined with the chandelier behind the ceremony site meant that very little additional decor was needed. We drew guests’ attention to the couple with simple columns and flower arrangements, and kept the chairs in a natural wood to allow the space to shine. 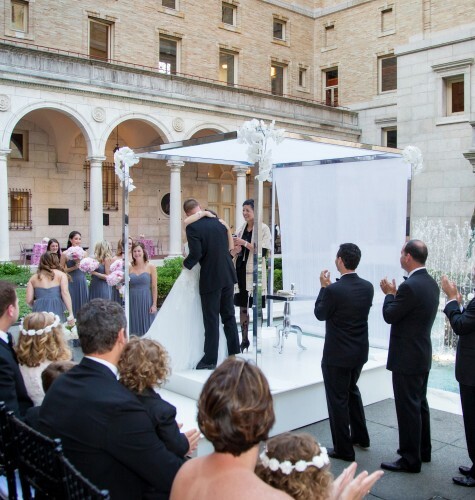 The Courtyard: An outdoor ceremony downtown is a rare thing, but The Courtyard at the Boston Public Library provides the opportunity to be married outside in a private, enclosed space. The beautiful water features in the fountain, artchways and architecture provide a European, almost church-like setting under the sky. 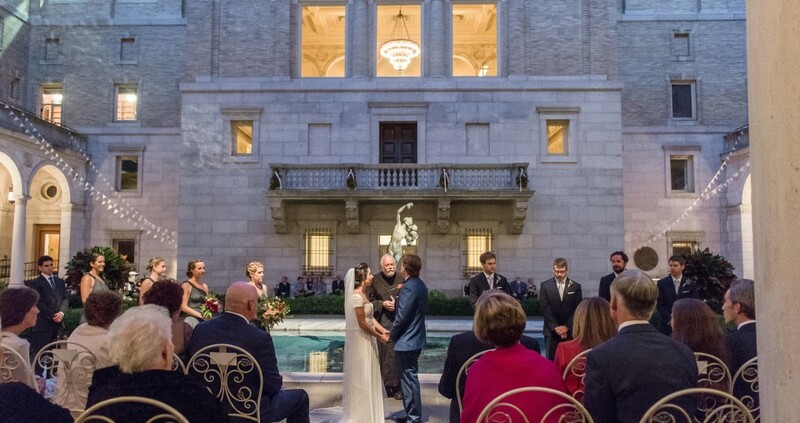 For more information about ceremony and reception options at The Boston Public Library, visit our new virtual tour of the library.